Phil Aynsley and Hamish Cooper were “flies on the wall” at 2016 Australian Grand Prix for the entire race weekend. Every practice, qualifying and during the race they were inside Ducati’s pit garage and they both gained the belief that Ducati was about to start something special. YOU CAN FEEL electricity in the air as mechanic Mark Elder wheels Andrea Dovizioso’s Desmosedici into pitlane. This is the culmination of two days of work creating a potential race winner from 46 boxes flown over from the previous round in Japan. A drag-racing-style starter is pushed onto the end of the crankshaft and the V4 engine bellows into life, quickly settling into a fast idle. Using a starter rather than rollers means the gearbox doesn’t get loaded up. Mechanics and technicians circle the noisy beast, which soon sounds angry as the throttle is twisted, building revs and engine heat. 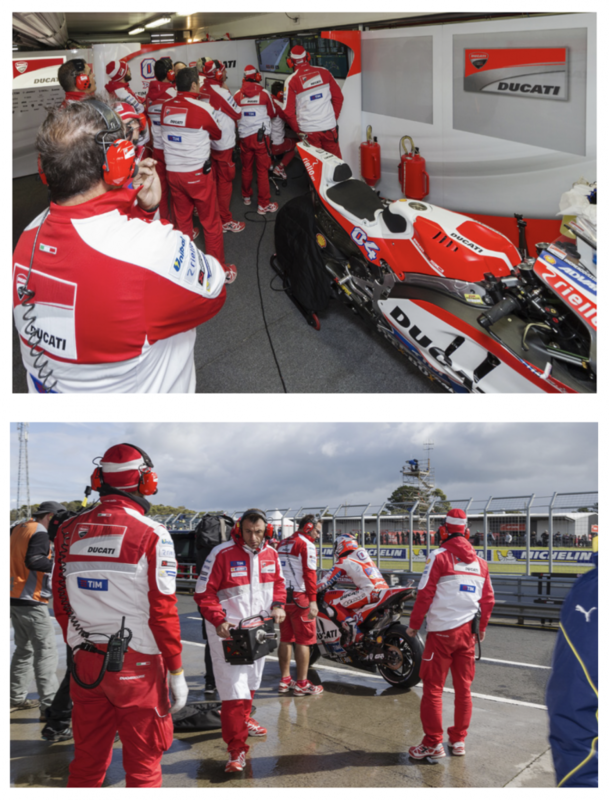 ‘Desmo Dovi’ pulls on his helmet as final pre-flight checks are concluded. Icy wind, sheeting rain, 14°C track temperature and the fact that it’s the first time Michelin tyres have been used in a MotoGP race at Phillip Island since 2008 have raised stress levels, yet there is a calm bubble around the team. Dovi clicks noisily into first gear and disappears down pitlane. Most of the mechanics and technicians, including the team’s hierarchy, retreat to the garage monitors. Transfixed by the wall of screens, they look like everyday punters analysing the odds at a betting agency – apart from the uniforms. I can easily recognise Dovi’s Desmosedici as it howls down the straight. The V4 has a deep, brutal roar that is an octave below the distinctive drone of Yamaha’s cross-plane in-line four-cylinder, Honda’s rasping V4 and the shrieks of the Suzuki and Aprilia. Dovi breaks this session into three runs. Mechanics and technicians go into overdrive during his brief stops. They replace his rear shock absorber and linkage, pull apart the top of the fork to change the springs and move the stanchions through the yokes to quicken the steering. All this is done with a calm efficiency that is amazing to watch, especially in such a cramped space. Out goes Dovi again into conditions that would have road riders thinking twice about whether it was worth the effort. But he has to log many race-speed kilometres to give the technicians something to analyse. He plugs away through the murk and mist, shaving seconds off each lap. By the time he calls it quits he has finished up sixth fastest, taking his time from 1m48.978s down to 1m41.569s. 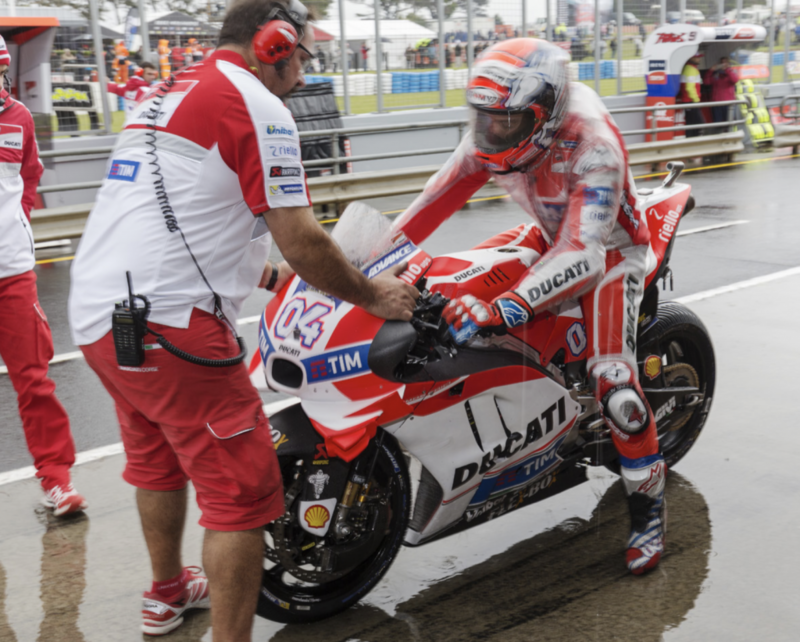 Technicians pore over the tyres while Dovi pulls off his helmet to sit sodden in his chair. 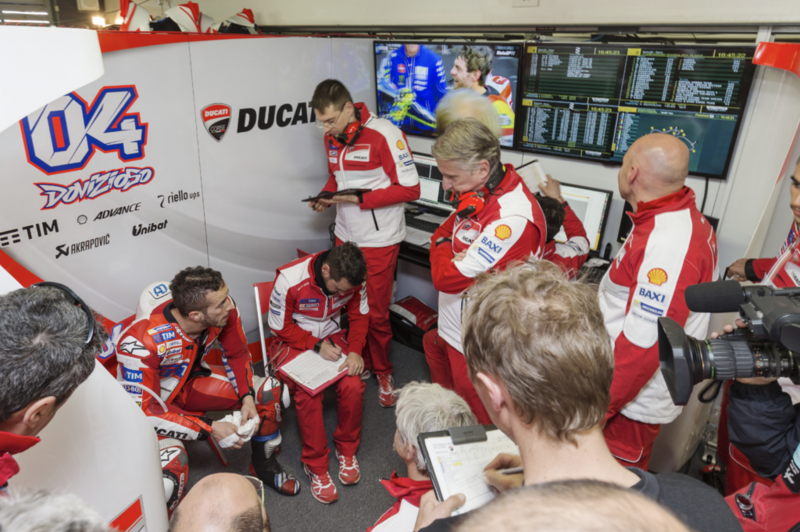 Crew chief Alberto Giribuola sits beside him with a clipboard taking notes while some heavy hitters, including team mastermind Gigi Dall’Igna, simply kneel before him, hanging on Dovi’s every word. Gigi then walks over and touches the rear tyre before the bike is pushed up on a workbench. The team has a little over three hours to debrief and apply what they have learnt in the past 45 minutes to improve Dovi’s Desmosedici for the next outing. CONDITIONS WORSEN AND officials delay the start. Eventually just six riders venture out. Dovi’s bike is put through its usual warm-up procedure: three minutes at fast idle followed by another two minutes of gentle revving that booms through the garage like a pump- action shotgun. No one seems in a hurry to send him out and the session is soon red-flagged, ending the day’s work. A SLOWLY DRYING track but a constant threat of rain has technicians weighing up the options for this crucial session. Riders have to finish in the top 10 to avoid the 15-minute madness of Qualifying 1, from which only two can graduate to the final grid shootout of Q2. Dovi’s sixth position in FP1 looks good but fill-in teammate Héctor Barberá is back in 19th. Gigi looks grim as he follows his riders’ progress on the pit monitors. Information fed back includes crucial sector times, and comparing these lap by lap can give clues to possible changes to improve handling into corners and traction out of them. Suspension technician Peter Bergvall gently lays an Öhlins shock under Dovi’s second bike, which is missing its wheels. Mechanics and technicians descend on it. Two strip out and replace the rear shock while another fits the front wheel and mudguard, and two others put a different sprocket on the rear wheel, push it into place, adjust the alignment with a special template tool, then set the chain tension. Up close the Desmosedici is an elegant kitset of carbon and exotic alloys. Its distinctive wings are pop-riveted to slim pieces of bodywork held in place by tiny allen screws. The small details are stunning. Strangely, instead of open megaphones the exhaust tips have muffler-like inserts in them. Looking closer at Dovi’s bike reveals his thumb-operated rear brake, with the small lever on the left handlebar. It’s easy to see how $2 million is sunk into a typical MotoGP motorcycle. Just five minutes into the session and Dovi suddenly appears. He leaps off, shouts a few words then jumps on his second bike and is gone as the garage fills with the smell of a hot engine, brakes and tyres. A mechanic screws a special fitting into the petrol tank filler and a jug of fuel is then poured in. Mechanics and technicians swarm over the bike, changing the rear shock, adjusting the front fork and replacing the front wheel. Halfway through the session the weather closes in and riders start crashing. 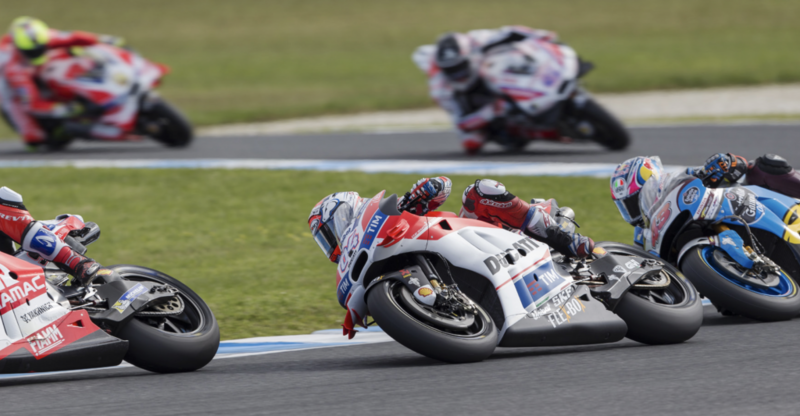 Dovi’s back in and some big decisions are made regarding set-up and tyre choice. The rain will go away and riders, including Marc Márquez, will set their fastest time. Then rain will return for the closing laps. Dovi has four runs during the session. Each time his bikes have been heavily tweaked. Wheels changes include slick front tyre with intermediate rear, wets both ends, or slicks both ends. It’s been a flurry of activity but Dovi’s 1m34.721s, set on his final lap, puts him fifth overall. Meanwhile, Barberá has nailed 10th ahead of Suzuki star Maverick Viñales, Valentino Rossi and Cal Crutchlow, while Jorge Lorenzo is stone motherless last. Amazing. What is also amazing is that of Dovi’s 13 laps, only five have been at full noise. Four bike swaps with the two bikes being modified multiple times for just five serious laps. That’s MotoGP racing for you. WITH BOTH RIDERS straight through to Q2 the stress levels are back under control. Now the team needs a long run to gauge tyre life during the actual race. Actor, motorcyclist and regular pit visitor Keanu Reeves has just left and it’s time to get to work. However, the session is red-flagged by torrential rain after just 10 minutes and the bikes don’t go out again until 3.10pm. A paltry six full laps will not give the team much information. TWELVE RIDERS HAVE 15 minutes to fight for the first four rows of Sunday’s starting grid. There’s no Rossi, and Lorenzo has only just snuck into Q2. This certainly is a bizarre weekend. Again, the weather is the wildcard. Although it’s cold and threatening, the air is dry and the track is 19°C and not as slippery as it looks. However, the weather radar shows a big rain front on the way. Márquez gambles on full slicks to set pole with a 1m30.189s – well outside Lorenzo’s race lap record of 1m28.108s. With minutes remaining Dovi pits to change from an intermediate to full slick rear. But he’s soon back shaking his head. Even on the out lap he could feel the tyre wasn’t hot enough on its left side. It means he’s qualified ninth and is on the third row. Barberá is 10th and on the row behind. However, in what could be a significant omen, both Ducatis have rediscovered their awesome top speed. Barberá has clocked 332.7km/h and Dovi 330.3km/h. The next fastest is Crutchlow at 326.8km/h, who is second on the grid. Márquez is sixth fastest at 324.8km/h. TEAMS HAVE ONE last chance to calibrate their machines and calculate team strategy. Today the track is dry, the chilly wind is keeping the rain away and the sun is out. It’s still only 12°C but the track temperature is 28°C. 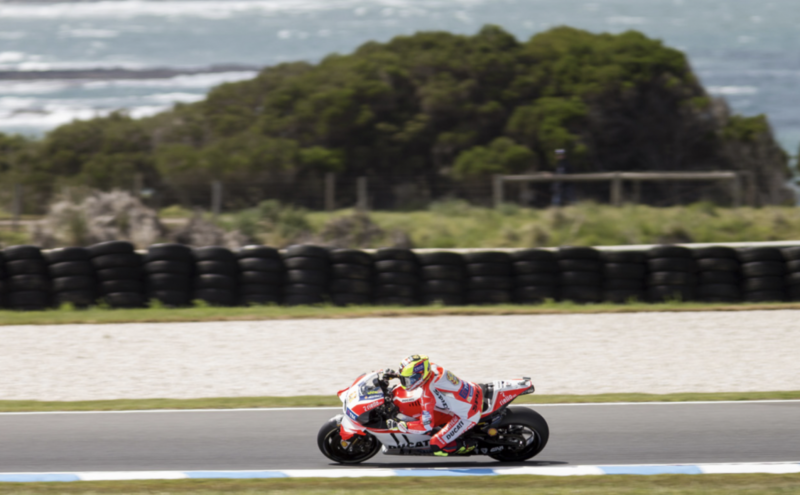 Dovi and Barberá up their top speeds, hitting 336.5km/h and 334.0km/h respectively. Ducati’s dominance down Gardner Straight is underlined by Danilo Petrucci’s 332.4km/h on a customer GP15 Ducati, a slightly upgraded version of last-year’s Desmosedici. Even Mike Jones, the Aussie stand-in at Barberá’s usual team, hits 330.5km/h, faster than Márquez at 329.2km/h. But in a snapshot of how the race could unfold, Márquez sets the fastest lap of 1:29.897, ahead of Rossi, with Viñales – who qualified 13th and a row behind Barberá – third fastest. Crutchlow is fourth quickest with Dovi eighth and Barberá 12th. Since the race doesn’t start until 4pm, Dovi and Barberá head to the Ducati supporters tent for a ‘meet and greet’ session. 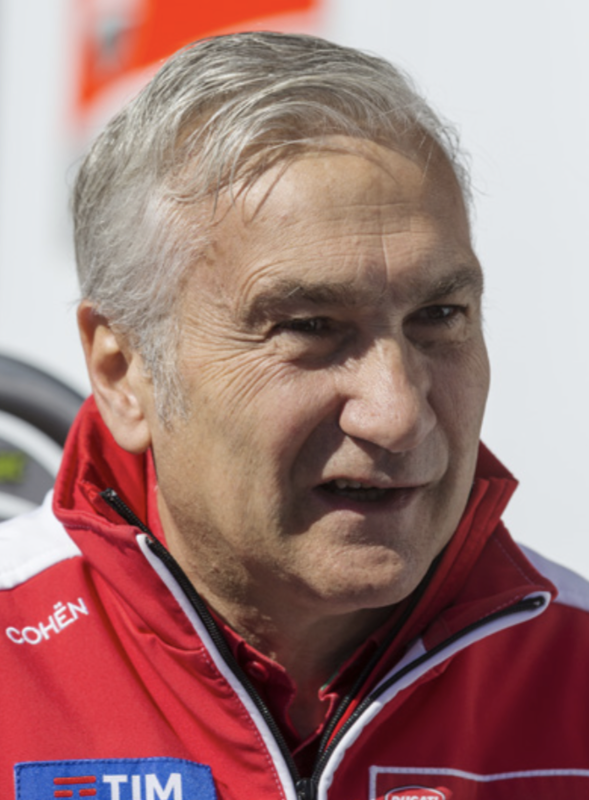 Earlier in the weekend Michelin’s motorcycle manager Piero Taramasso said his company had produced a “Phillip Island tyre” to meet the unique conditions at this circuit. He also acknowledged that the event is Michelin’s “own Grand Prix” as it deals with the island’s “four seasons in a day” for the first time. 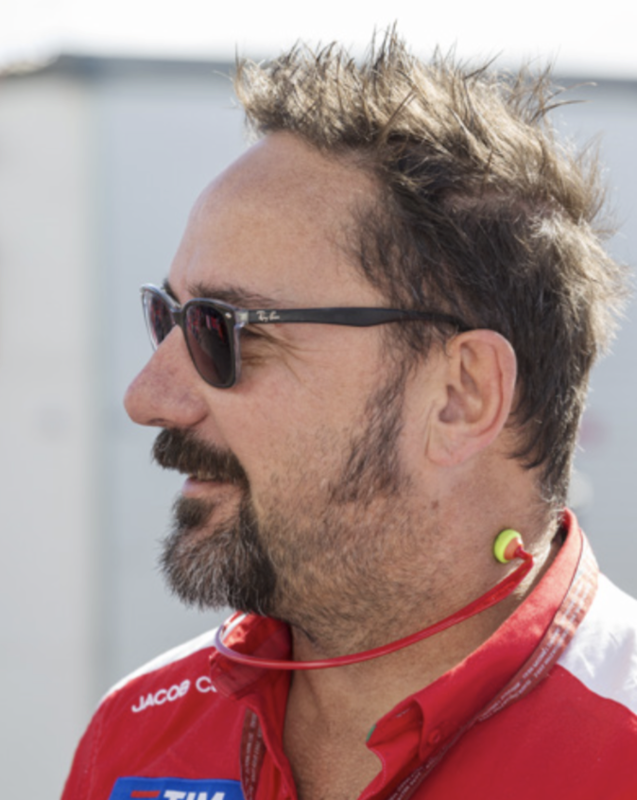 Fans are given another insight by Ducati Corse sporting director Paolo Ciabatti. During a short Q&A session with other team principals he explains how its MotoGP effort has been through “some difficult years” and how Gigi and Casey Stoner have brought a new focus. “We’ve finally managed to win a race,” he says, referring to Andrea Iannone’s breakthrough win at the Red Bull Ring in Austria. “So far we are quite satisfied,” he replies. THE PIT GARAGE is empty and silent. Most of the crew are out on the grid awaiting their riders. The rest are over at the pitlane monitor and signalling point. Rather than being with the official team, Dovi’s signaller is further down the wall as he prefers to read the board closer to the finish line. The two spare racebikes are propped up outside on race stands with tyre-warmers and thermal blankets. With no wheels visible the aerodynamic wings make the Desmosedicis look like personal spacecraft from a sci-fi movie. There is a tinge of nostalgia since this will be the last time we’ll see the bikes like this. New regulations will create a motorcycle that looks more like a streetbike than a prototype. Surely it diminishes the purpose of MotoGP, which is to build the world’s most futuristic two-wheeled racers. My thoughts are shattered by a wall of noise as the grid forms. Whereas in practice and qualifying the bikes gently took off on their laps, here they are all in unison. Riders grab handfuls of throttles as they get ‘into the zone’. Mechanics and technicians jog back into the garage and cluster around the screens. They appear calm but you know a kaleidoscope of thoughts is tumbling through their minds. Dovi’s on the charge from the start. By lap two he has slipped past Jack Miller into fifth. On lap three he is hunting Suzuki’s Aleix Espargaró, who started from fourth. Then Rossi slices through the field from 15th to catch Dovi. Dark clouds briefly blot out the sun in pitlane. Instantly eight mechanics run to the two spare bikes and change them to wet weather spec in a blur of tools, wheels and suspension components. Márquez crashes out of the lead and Crutchlow takes over. He then begins a Lorenzo-like performance, reeling off fast laps as consistently as a musician’s metronome. Dovi is blindingly fast down Gardner Straight, eventually recording 340.5km/h. A podium finish is possible, but he is struggling in the corners. The ragged edge beckons when Dovi is caught in a Suzuki sandwich of Espargaró and Viñales. Espargaró brakes into Turn 4 and his front wheel snaps away, slamming him into the tarmac. Steady on, Dovi, it could be you next time. Rossi is into second but can’t catch Crutchlow while Viñales slowly pulls away from Dovi. Sometimes championship points are more important than podiums and Dovi is showing how he will be a rock-solid foundation for Lorenzo next season. He finishes fourth but back in the pit garage Gigi greets him like a winner with a fatherly hug and some words of praise. 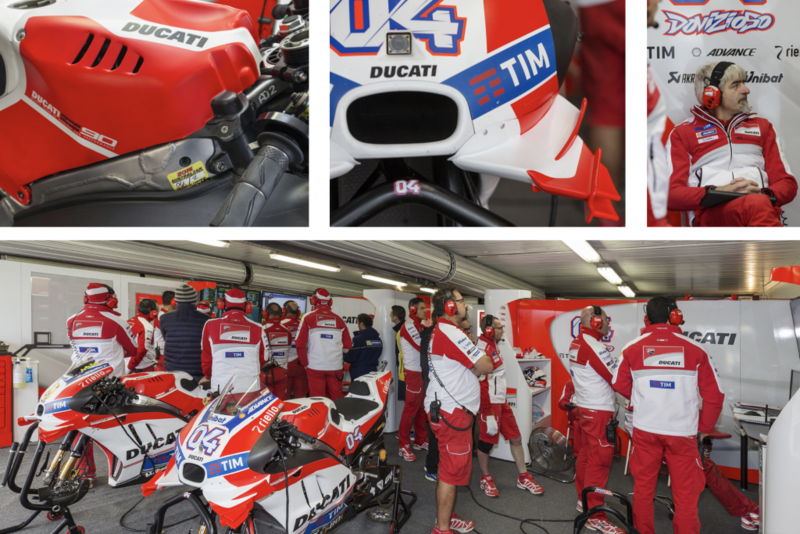 There is a strong dose of reality in Ducati’s racing garage that makes you realise something truly great could happen next season. Honda will have Márquez, this season’s winner. Ducati will have Lorenzo, last season’s under-rated champion. Yamaha’s lead rider will be Rossi, who last won a title in 2009. Do Suzuki, Aprilia and KTM have a rider who can challenge? Following Dovi’s magnificent win at Sepang, Ducati needs a fired-up Lorenzo to continue this year’s momentum to become MotoGP’s top dog again. American Mark Elder has been with Ducati’s MotoGP effort since the beginning. “This weekend is about as crazy as it gets,” he said after qualifying. 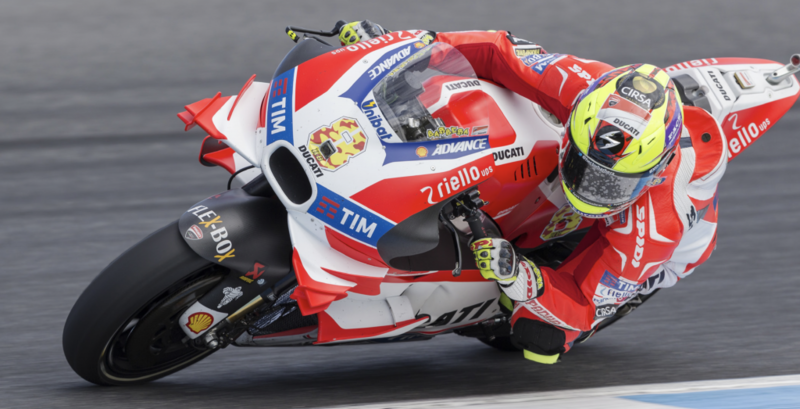 Asked if Ducati had slowed the number of technical changes since the well- publicised Rossi period, he shook his head. “There are actually more changes now but the difference is we aren’t going from concept to concept,” he said, referring to Rossi ditching the carbon frame for an alloy beam. Elder is moving to an important role with Yamaha next season. Superbike legend Davide Tardozzi was brought back to organise logistics and bring his significant store of race wisdom to bear in moments of crisis.